Rock music with The Broken Thumbs and Thunder & Lightning. Free show by listening to Rock 94 1/2 as part of the GA’s Too Broke to Rock series. Many rock musicians start bands hoping they’ll have enough success to never have to work a typical day job – or in some cases, avoid college and the studying it takes to earn a degree. Dustin Bates, the man behind the band Starset, is not one of those musicians. In fact he holds a doctorate in electrical engineering from Ohio University and was positioned to work on leading edge technology before the opportunity to have a viable music career opened up. He had finished his course work and was doing a dissertation, while also doing research for the Air Force, when music intervened. “I did numerous projects in automated robotics and highly accurate navigation,” Bates said during a mid-January phone interview. Instead, the band Bates had during college, Downplay, started making the right kind of noise. Specializing in a mainstream rock sound with a bit of an alternative slant, Downplay released several independent albums and was courted by labels. In 2010 the group signed to Epic Records, which green-lighted a first album for the label. “Almost simultaneously with the completion of the record, the label got a new president and we were dropped instantaneously as they changed the direction of what they wanted to do,” Bates said. This, obviously, was a major disappointment and a genuine setback for Bates. But looking back, Bates feels seeing the Epic deal end was not such a bad thing. Bates began thinking about a new musical direction and forming a band with a much more substantial message – one that actually tied back into his collegiate and post-graduate studies. He came up with a concept for a fictional science organization known as the Starset Society led by an equally fictional president, Aston Wise. The society had received a transmission from outer space that foretold the demise of humanity on earth but also included instructions on how to prevent this catastrophic outcome. This message would be brought to the masses through a very real band called Starset. That group will release its second album, “Vessels,” on Friday, and its music and message have connected on a fairly major scale during its brief existence. 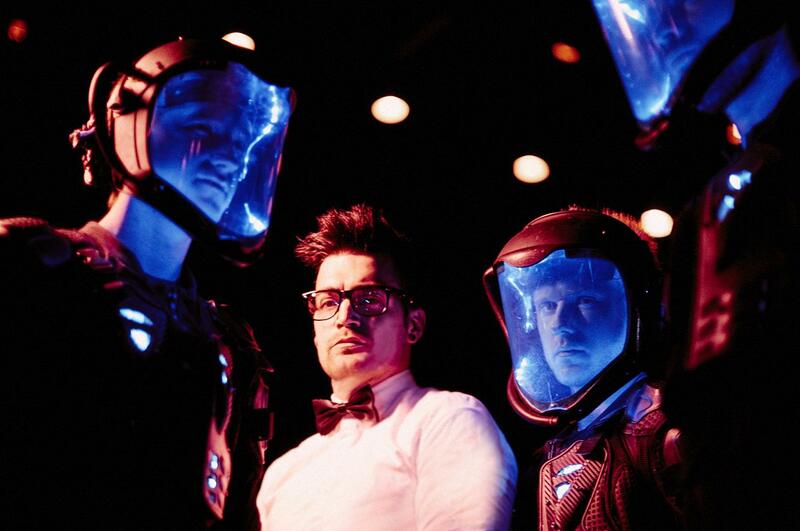 Starset’s 2014 debut album, “Transmissions,” spawned a single, “My Demons,” which set the record for the longest run of any song to stay in the top five on Billboard’s Mainstream Rock chart at 41 consecutive weeks. The album’s impact was perhaps even more remarkable online. The band opened two YouTube accounts to host its videos and other content. According to a Nov. 19 Billboard magazine article, those pages generated more than 85 million views. But Starset’s music exploded primarily in the gaming and anime communities on YouTube where account holders uploaded video content from the band and/or created videos set to Starset music. A whopping 534.8 million views were generated by fan-created content. The music Bates has created fits with the scientific/technology themes of the lyrics. It brings together elements of electronic music, hard rock and metal (the “Vessels” songs “Into The Unknown,” “Gravity Of You” and “Frequency” are prime examples of that stylistic mix – and even integrate a few metalcore-ish screams into their otherwise melodic vocals), while also adding in a good bit of expansive pop (“Satellite” and “Die For You”) and even a touch of progressive rock (“Starlight”). Despite its diverse ingredients, Starset’s sound is cohesive, cinematic and impactful. Bates is excited to take the new music to the live stage. Starset’s first tour in support of the new album takes the band to clubs and small theaters, but that isn’t keeping the group from bringing the kind of high-tech visual production the band used when it opened large venue shows in 2015 for Breaking Benjamin. Once again, there will be video, and with Bates out front on vocals, keyboards and guitar, the other band members – bassist Ron De Chant, guitarist Brock Richards and drummer Adam Gilbert – will wear the space suits that have become a signature of Starset. But there will be differences. “We’ve upgraded the suits this time,” Bates said. “We’re calling them the Mach III. They’re a lot different. We’re excited about that. We’re actually going to continue upgrading those as the tour goes on. We have a (production) piece that’s so cool and so innovative that I don’t even want to really spill the beans on it.